In a previous Tech Tip article I encouraged users to set up a comprehensive backup system by partitioning a hard drive into two pieces and then configure Carbon Copy Cloner and Time Machine to backup to the two partitions. Here are some more detailed setup instructions. Next, click the Partition tab. In the Volume Scheme section select 2 Partitions. Fill in appropriate names and sizes in the fields on the right-hand side. I recommend making the first (top) partition your partition for storing Time Machine backup data and the second (bottom) partition your partition for storing your Carbon Copy Cloner full bootable backup. The reason for putting the Time Machine partition on top is so that you can more easily make the second partition larger, as needed, in the future. To determine appropriate sizes you should click on your Mac’s hard drive icon on your Desktop. Then go the File menu and select Get Info. Look at how much space, measured in gigabytes (GB) is being used and look at the drive’s total capacity. At a minimum the size for your Carbon Copy Cloner partition needs to be large equal to the number of gigabytes currently used. I typically make the partition at least 10-20% bigger to allow for growth in the amount of data on your hard drive. I suggest naming the partitions something like Time Machine Backup and Full Backup. If you’re going to follow my recommendation and switch between two backup hard drives then you should add letter or number designators in the partition names, such as Time Machine Backup A. Set the Format to Mac OS Extended (Journaled). Click the Options button and make sure you select GUID Partition Table if the drive is connected to a Mac with an Intel processor. Select Apple Partition Map if the drive is connected to a older Mac using a PowerPC G4 or G5 processor. Click the Apply button so the drive will be partitioned and then formatted. When Disk Utility finishes the drive is now ready for use. If my instructions are too brief, you might benefit from Ken Stone’s detailed instructions with lots of pictures. Two icons representing the two hard drive partitions will appear on your Mac’s Desktop. Go to the Apple Menu, select System Preferences and click on the Time Machine icon (Mac OS X 10.5 or newer is required). Click the Select Disk button and pick your Time Machine and then click the Use for Backup button. Apple offers a succinct introduction to using Time Machine. After you download and install Carbon Copy Cloner, open it from your Applications folder. In the Source Disk section select your Mac’s internal hard drive which is typically named Macintosh HD. 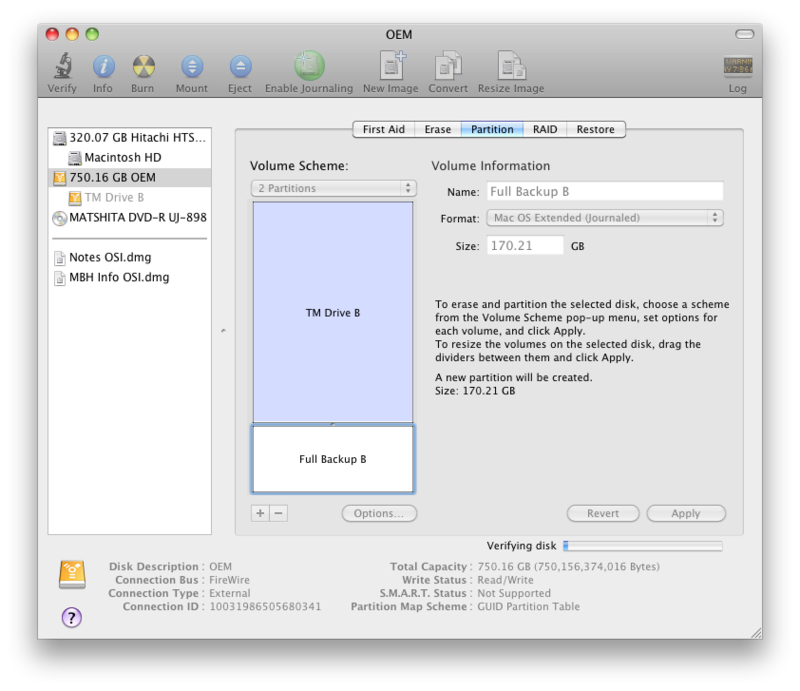 In the Target Disk section select the smaller partition which you created in Disk Utility. Click the padlock icon in the lower left corner and enter your Mac OS X administrator password, then click the Save Task button. In the Scheduler window that appears enter a name for the task in the Scheduled Tasks section. On the right-hand side, in the “Run this task:” section select “When Target is Reconnected.” Click the Save button in the lower right corner to save this configuration. The developer offers lots of support and instructions for Carbon Copy Cloner. You have now partitioned an external hard drive and configured Time Machine and Carbon Copy Cloner to backup to each of the partitions. If you follow my recommendation of buying two external backup hard drives then you’ll want to repeat this setup procedure for the second drive. Next week I’ll provide instructions on how to swap between two hard drives and have Time Machine backup to both hard drives. Update February 2017: With Mac OS 10.11, Disk Utility’s user interface was revised. While the directions above will still work, the interface will look different from that listed in the instructions. Read more about Apple, Carbon Copy Cloner, Computer Basics, Disk Utility, partition, Time Machine.